UPDATE: Tsunami Warnings Canceled After Quake In Costa Rica : The Two-Way An estimated 7.6-magnitude earthquake in Costa Rica raised alerts for the Pacific coasts of Costa Rica, Panama, Nicaragua, El Salvador, Honduras, Mexico, Colombia, Ecuador, Guatemala and Peru. The Pacific coasts of Costa Rica, Panama and Nicaragua are no longer the focus of tsunami warnings, the Pacific Tsunami Warning Center announced just after 1 p.m ET. As we've been reporting, there was a strong — 7.6 magnitude — earthquake in Costa Rica this morning. At first, there were concerns about possible tsunamis from Mexico south to Chile. As the day continued, however, authorities gradually reduced their warnings. There still isn't much word about the extent of any damage in Costa Rica or whether there were any deaths or injuries. Reuters says the temblor "rocked Costa Rica ... rattling buildings, cutting power in areas of the capital and triggering a tsunami warning, though there were no immediate reports of casualties." Two deaths have been connected to the earthquake, Reuters reports. Red Cross spokesman Freddy Roman tells the wire service that one person suffered a fatal heart attack. It adds that local news outlets say another person was crushed under debris. "There are reports of some damage in Nicoya, on Costa Rica's northern Pacific coast," NPR's Larry Abramson emails from Costa Rica, where he has been vacationing. He has not heard of any "serious damage or injuries." An estimated 7.6-magnitude earthquake in Costa Rica this morning briefly triggered tsunami warnings for the Pacific coasts of Costa Rica, Panama, Nicaragua, El Salvador, Honduras, Mexico, Colombia, Ecuador, Guatemala and Peru. A warning means "a tsunami is imminent and that coastal locations in the warned area should prepare for flooding," according to the National Oceanic and Atmospheric Administration. 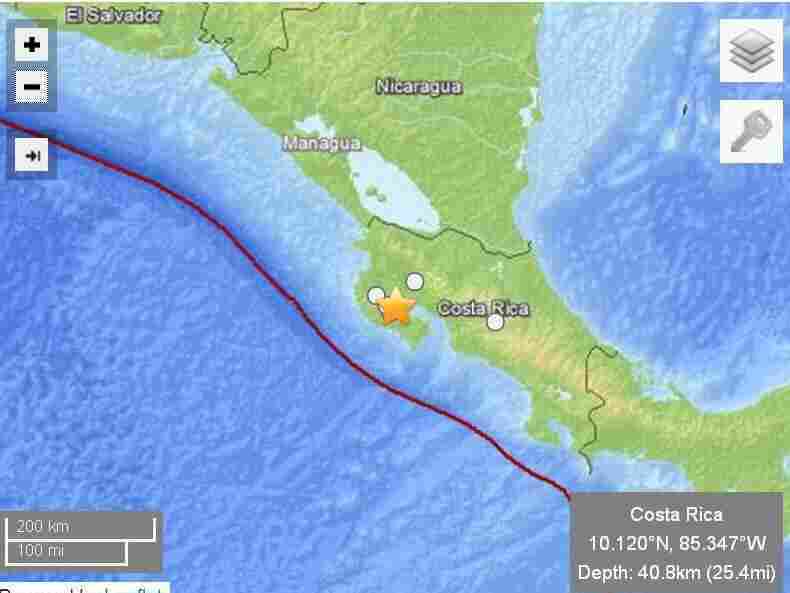 The star marks the epicenter of today's earthquake in Costa Rica. A slightly less ominous "tsunami watch" has been issued for Chile. According to NOAA's Tsunami.gov website, "an evaluation of the Pacific-wide tsunami threat is underway and there is a possibility that Hawaii could be elevated to a watch or warning status." There's no word yet on the situation in Costa Rica. Saying there are no changes from its previous bulletin, the Pacific Tsunami Warning Center just repeated that there are now tsunami warnings for the Pacific coasts of Costa Rica, Panama and Nicaragua. Meanwhile, the BBC says that "Douglas Salgado of the National Commission of Risk Prevention and Emergency Attention told the Associated Press news agency that there were no initial reports of damage or deaths in the earthquake zone. He said officials were having problems reaching people in the area nearest the epicenter." "The earthquake this morning was quite significant," says NPR's Larry Abramson, who is in Costa Rica on vacation. "It's one of those experiences where you feel like the wind is blowing very hard and then you realize that basically the entire house is shaking." Larry adds that it was "pretty intense" for about 30 seconds. Where he is, in the mountains near San Jose, there does not seem to be extensive damage. The Pacific Tsunami Warning Center now says it has canceled tsunami warnings for El Salvador, Honduras, Mexico, Colombia, Ecuador, Guatemala and Peru. That leaves three countries still in the "warning" zone: Costa Rica, Panama and Nicaragua. Update at 11:25 a.m. ET: The earthquake struck at 8:24 a.m. local time (10:25 a.m. ET).